Japanese gaming publisher and arcade company Konami has announced a new music-based rhyhm action game to compete with the likes of Activision's Guitar Hero and MTV/Harmonix's Rock Band franchises. "Konami is arguably the originator of the 'rhythm action' genre, with ground-breaking titles such as the ever-popular Dancing Stage series, plus classic music-themed titles as Karaoke Stage, Beatmania and Guitar Freaks," reads the press release just in. "The publisher has now returned to the genre it pioneered with the most advanced music title for any format, with Rock Revolution boasting the most authentic drum kit imaginable, while bass and lead guitar accessories are also supported." Further details on Rock Revolution are scarce, other than players can choose to play as one of 15 realistic avatars, "while co-operative modes and band competitions up the ante as groups take on like-minded friends in a true battle of the bands." Konami's answer to Rock Band/Guitar Hero also features a 'Rehearsal' mode for practice and "a stunning 'Studio' mode allows users to freeform their own tracks and record them on the game's exhaustive multi-track studio." 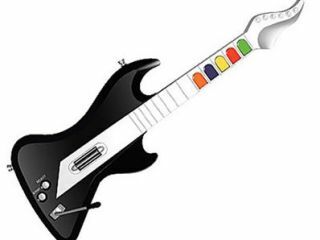 The Wii version of the game will allow for Air Guitar and Air Drum play via the Wii Remote and Nunchuk controllers, "while the motion-sensitive nature of the hardware can also reward the user for rock star-like behavior in pulling off scissor kicks or instrument abuse during the course of a performance." The DS version of the game "allows users to choose their instrument and use stylus gestures to match the on-screen instructions for the 20 tracks on offer…. [plus] also has customisable venues where props such as fireworks and laser shows can be unlocked to wow the crowd." Rock Revolution from Konami is due early 2009. More details on the game and it's peripherals to follow later this very week. Can the originators of the genre steal the rock game crown? A new Guns N' Roses song, "Shackler's Revenge," from the forthcoming "Chinese Democracy" album will be debuted on MTV/Harmonix's Rock Band 2 videogame in September. The New York Times claims that the band's innovative use of Rock Band 2 to launch its much-awaited new single should also mean that "Chinese Democracy" should see an official release via Interscope sometime later in 2008. Nine tracks from the album already leaked onto torrent sites earlier this year.